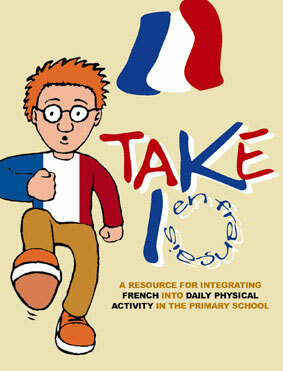 Take 10 en français is a resource that helps primary school children to practise their French in a fun way whilst taking part in short tasks of daily physical activity. In doing so it brings together two major educational initiatives and offers the potential to significantly improve children's learning potential. Take 10 en français is based on the highly sucessful resource pack Take 10 - Fit to Succeed, a collection of great ideas to get primary children active for short 10-minute periods and now used in many schools across the country. Take 10 en français takes many of the ideas from the original resource and adapts these to support the teaching of French. Teachers do not need a high level of linguistic competence to use the resources; the activity rhymes can be used without the teacher having to speak any French at all. "An exciting resource accessible to teachers with little or no language." 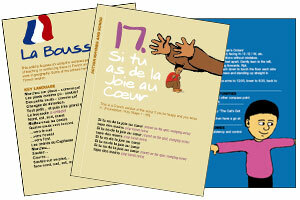 Developed for use with children aged 3 -11 who are beginners to the French language. There are separate activities for Foundation, Key Stage 1, Lower Key Stage 2 and Upper Key Stage 2. A great book to keep handy for a lull in lessons. Some of the games require a lot of space, however, which is not always practical but with a little adaptation this is a very useful resource. Great resource, I understand it can look a little pricey but the games in there are fun, there is everything you need for songs, activities etc... Would thoroughly recommend this book to anyone. Wednesday, 27 March 2013 | . We have not yet used them in school as our MFL teaching has been re-structured this academic year. I'll be in touch later. I've rated it based on prior knowledge. An excellent resource to reinforce kinaesthetic activities in the language program. Highly recommended. I am happy I bought this book along with the CDs and DVD but would have liked suggestions on how to use them: examples of how to get started. A brilliant resource. Very practical and informative. My classes loved it!! An excellent resource. My year 6 class really enjoyed the action rhymes and I found it was a great way to introduce a new language to KS1. I would definitely recommend this pack! A very good resource to help primary teachers integrate french into daily classroom routines, PE warm ups, wake up and shake up acitvities etc. Some activities lend themselves better than others for non specialist teachers. A great resource - very practical and easy to use. Helpful cd to aid pronunciation. Would recommend this to any MfL teacher, and others!